Post written by Malay Sharma from the Jaswant Rai Speciality Hospital. We present a case of acute cholangitis due to biliary ascariasis mimicking biliary stent on ultrasonography. Biliary ascariasis is not commonly seen in western countries, hence the reason for showcasing this video. A 50-year-old-man presented with acute cholangitis. He underwent multiple ERCP procedures with removal of stones and plastic biliary stent placement 1 year previous. Abdominal USG showed dilation of intrahepatic biliary radicles and dilated CBD (11 mm) with a linear echogenic structure. A possibility of cholangitis resulting from stent occlusion was considered. On ERCP, no stent in situ was seen. The CBD was cannulated and after balloon sweep, a live creamy-white worm was removed from the papilla which was identified as Ascaris lumbricoides. Figure 2. US view of abdomen showing Ascaris lumbricoides mimicking stent within dilated common bile duct. 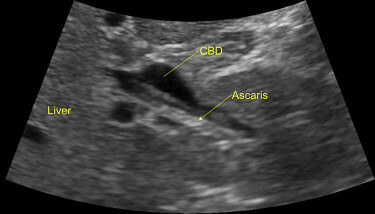 The sonographic patterns of biliary ascariasis include single or multiple long, linear echogenic strips without acoustic shadowing in the CBD or PD (strip sign); a central, longitudinal, anechoic shadow within the worm (inner tube or double tube sign); spaghetti-like appearance; and a characteristic movement. The sonographic appearance of A. lumbricoides in the CBD can mimic biliary tubes, catheters, or stents as in the present video. Biliary ascariasis should be considered in a patient presenting with acute cholangitis in endemic regions. The treatment of biliary ascariasis is conservative, leading to resolution in 70% to 80% of cases. Worms migrate out of the ducts within a few hours to 2 weeks and are paralyzed by anthelmintic drugs, followed by natural expulsion in the stool. Endoscopic intervention is required in 20% to 30% of cases. Indications include failure of conservative treatment, persistence of worms in the biliary tree for more than 4 weeks, acute cholangitis, and dead worms coexisting with stones or biliary strictures. Worms visible at the ampulla are extracted endoscopically with a Dormia basket, rat-tooth forceps, or biopsy forceps. Sphincterotomy should be avoided for worm removal because an open biliary sphincter facilitates future recurrence if worm reinfestation occurs.